The church of St Andrew's at Soham is a superb cruciform building, begun around 1180 and rebuilt in the 14th and 15th centuries. At first glance this latter work makes the church appear to be Perpendicular, but there are ancient underpinnings. Indeed, St Andrew's can date its beginnings back to the mid-7th century, when St Felix established a monastery here as part of his effort to Christianize the East Angles. The monastery was sacked and destroyed by the Danes sometime around 870AD. 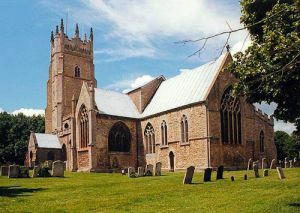 Around 900 a Saxon cathedral was erected at Soham, and the relics of St Felix were kept at the cathedral (they were later pilfered by monks from Ramsey Abbey in 1030, in a daring midnight raid that would not have been out of place in a modern spy thriller). Traces of the Saxon church can be seen incorporated into the current building. The interior architecture is simply superb; the 15th-century clerestory windows make the church seem light and spacious inside. Beside the main entry is the tomb of Mary D'Aye, the great-granddaughter of Oliver Cromwell. Abolitionist and former slave Olaudah Equiano (1745-1797) was married to Susanna Cullen in Soham church in 1792. They had two children, and both were baptised here. The roof is a wonderful piece of late medieval craftsmanship. In common with many East Anglian churches, it has alternating hammer and tie beams, ornamented with carved wooden figures of angels. It seems quite likely that the roof was the work of the same team of craftsmen responsible for the roof at St Andrew's church in Isleham. In the north transept is a quite lovely 15th-century screen, beautifully carved and painted. Also from the 15th century are a series of pews and misericords.